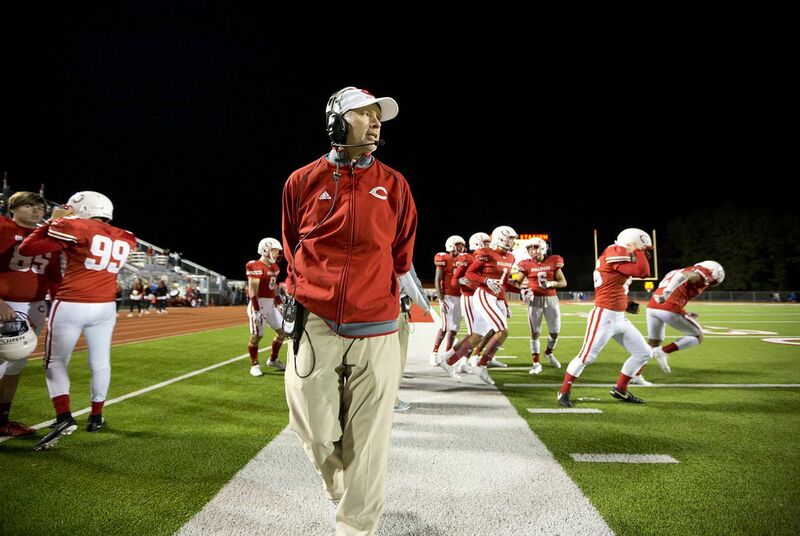 CARTHAGE, TEXAS - Watching his players dart up and down the field during a recent game, Carthage High head football coach Scott Surratt anxiously anticipated every pass, penalty and fumble, sometimes needing to be stopped from charging onto the turf. 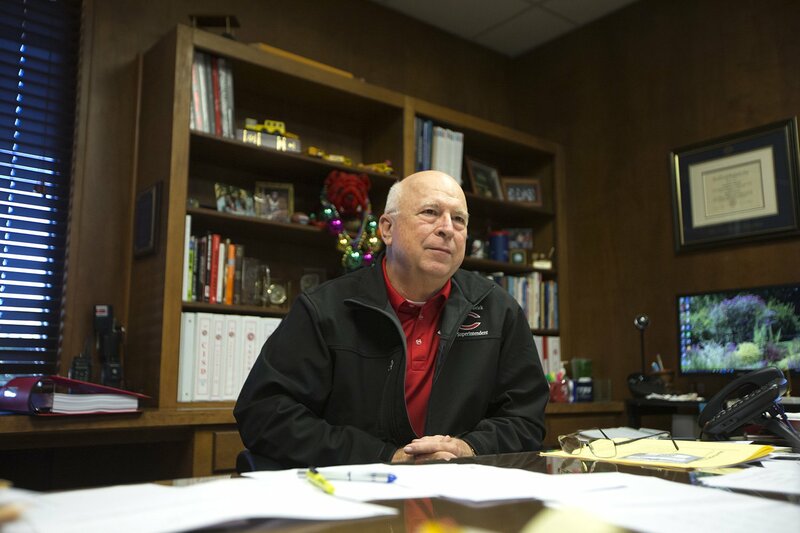 A local profile of the man who has brought five state football championships to Carthage ISD refers to his arrival 10 years ago as "the best thing that could have happened to a lackluster football program." Fans packing the stands dressed in "Bulldawg" red declare themselves lucky that he took the team's reins. Though Surratt has had opportunities to coach at larger high schools and at the college level, he's opted to stay in this small East Texas town 150 miles southeast of Dallas. "I got very lucky, very lucky to get the job," Surratt told The Texas Tribune. "[Our players] represent the seal on their helmet and do it with pride and play unbelievably hard for the community." As he succeeds on the field, Surratt, who's also the district's athletic director, has been rewarded off of it. Carthage ISD increased his salary this year by $21,400, the district's biggest administrative pay raise this year. With a total salary of $154,900, Surratt is paid just a little less than the high school football coach in Lake Travis, where the district's student body is nearly four times larger and its median income is six figures. Carthage ISD's median income is $49,886, a few thousand below the state average. 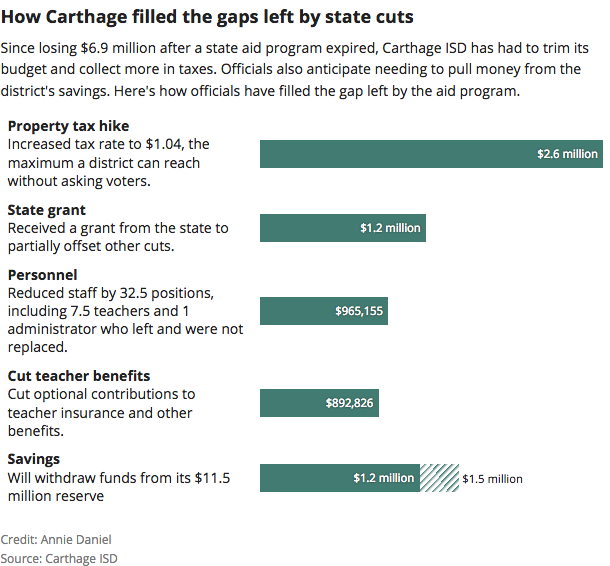 This comes at a time when Carthage ISD also lost $6.9 million after a state funding program primarily supporting rural, oil-dependent school Texas districts expired, forcing hundreds of school leaders to take red pens to their budgets. Carthage ISD raised local property taxes, slashed most teacher benefits, packed students in classrooms, and cut 32.5 teaching, security, transportation and administrative positions. Should districts like Carthage ISD increase administrative or athletic salaries when they are millions of dollars in the red? Local district officials argue many critics fundamentally misunderstand school budgets: Surratt paid for his own raise by bumping ticket sales and earning championship prize money. Each year, school communities across the state are debating where and how to trim while doing the least harm. School budgeting was a hot topic during this summer's special legislative session, when Lt. Gov. Dan Patrick and Senate Republicans argued that schools weren't spending efficiently, and they unsuccessfully pushed a measure requiring districts to "reprioritize" existing money to guarantee teacher raises. "[Districts] have to be better about how they spend the money. They have to put more focus on teachers," Patrick said at a July news conference. Education groups argued Patrick's plan would require districts to cut other staff such as instructional aides, who support teachers in the classroom. The issue gets more complicated as state cuts to schools become more standard, experts and public education advocates say. It's not always easy to tell whether school administrators, with limited options, are prioritizing cuts in a way that benefits students, teachers and families. The real problem worth discussing, many argue, is that schools are subsisting on meager funds. A recent report by the Center on Budget and Policy Priorities, a left-leaning think tank, shows that Texas made among the deepest cuts to public education in the last decade, compared with other states. 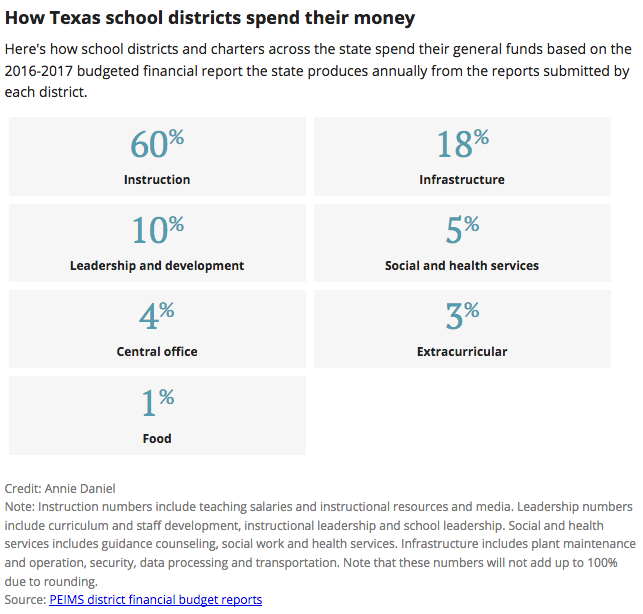 "The school district budget, while it may seem large, on a per-student basis is probably the most efficient budget in the city or county, wherever the school district is located," said Tracy Ginsburg, executive director of the Texas Association of School Business Officials, a nonprofit organization that analyzes school finance. "I think there was a time where school districts could become more efficient. That is in the back mirror." Personnel makes up about 80 percent of school spending, so "if you need significant savings, it's hard to do that without looking at staffing," said Greg Gibson, an Austin-based consultant who has helped about 150 districts, many of them in Texas, spend more efficiently over the last 25 years. Many districts start like Carthage ISD did by cutting back staff, consolidating positions and not filling positions vacated by staff members who retired or left, Gibson said. Smaller districts are by definition more efficient, with many people already serving more functions, meaning they face a bigger challenge in finding savings, he added. But some don't always agree with the methods of consolidation. After learning that Surratt's raise was coming while teachers' aides and bus monitors were being let go, Felita Ewins held a small protest outside the district administration building on the first day of school. An alumna of Carthage public schools, Ewins has grandsons who participate in athletics at the high school. "They do all of the sports . . . but it's not going to get them an education," she said. "That's uneven footing, if you want to cut someone that's helping them academically and give a raise to a department where it's not going to help them academically." Carthage ISD district sits on one of the country's largest natural gas reserves. The dip in natural gas prices means Carthage is currently low on revenue, and the state's decision not to renew a funding program further hurts the district. Carthage ISD will send about $9.5 million to the state this year, through the "Robin Hood" provision of the state school funding system, which requires districts with higher property values to subsidize those with lower values. In the next few years, if values don't rise organically, Superintendent Glenn Hambrick said, Carthage ISD will have to ask the community to vote to raise taxes again because the tax rate is far below the maximum allowed by state law. Hambrick said he donated his own $5,000 salary increase back to the school district. But he argued that Surratt has earned his raise by bringing large crowds into the stadium. When Carthage ISD won the state championship game last year, the league sent over a check for $32,357. "We would save a lot of money initially if we changed football coaches . . . But if we didn't make the playoffs anymore, we would lose that income," he said. "He justifies his salary by the amount of money or revenue the program brings in." Surratt's salary is part of Carthage ISD's extracurricular budget, which makes up just 4.7 percent of all spending. Ewins doesn't buy Hambrick's claim. With almost 20 positions cut in academic departments throughout the district, she says, why not use the football revenue to save a teacher's salary? Fans will fill the stands either way, like they did when she was a young girl. She acknowledges she's in the minority. Residents in the school district, who number about 16,700, are crazy about their high school team. The 400-member booster club raised $119,360 between January and October to supplement the school's athletic budget. Cutting any athletic program would harm students who use sports as an emotional outlet for difficult home lives, said Andy Dawson, head of the booster club and the father of a Carthage High junior who wants to go into sports medicine. For some, football provides a more realistic financial pathway to college, he said. Football is unlikely to see major changes, though Carthage ISD administrators could eventually have to consider cutting elective courses and extracurricular programs. Potentially on the chopping block is a free, dual-credit program with local Panola College, in which Carthage ISD now pays for students' tuition and books, said Jason Harris, the high school's principal. "Teacher morale is one thing I have to focus on. Every teacher here had a pay cut [with the reduced contribution to health insurance]. They're bringing home less money than they did and working the same amount of time," Harris said. "I have to think long and hard about positions and moving people and retaining teachers." He described the state funding cut as a "cloud that's hanging over" the district and its staff. Few understand the shadow that cloud casts more than Chris Stacy, high school academic coordinator and former coach. He was supposed to be promoted to assistant principal at Carthage High School, but the district realized they couldn't pay him an administrator's salary. Instead, he has cobbled together a similar role using stipends to boost his pay, while teaching math classes, supervising lunches, coordinating teachers and driving a school bus. "You lose a lot of extra services you were able to provide your students," he said. 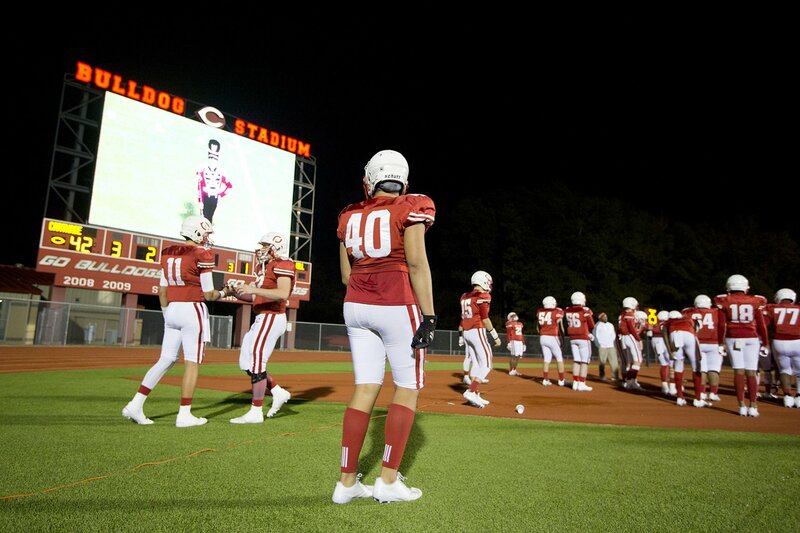 Carthage ISD caught a lot of heat for one specific extravagance, the crown jewel of its football field: a $750,000, four-camera Jumbotron, reportedly the biggest high school screen of its kind when it was installed in 2012. That's not a spending decision the district made alone, Hambrick said, sounding weary of repeating an answer he's given many times. About 73 percent of Carthage ISD residents who voted agreed to pay for the screen in a bond election; the money comes from a self-imposed hike in property taxes, not from school coffers. "We didn't throw it out there as anything other than what it is: a $750,000 luxury item," he said. It took just over a month for taxpayers to pay it off. For Ewins, the scoreboard is a reminder of a priority she does not share with her neighbors. "That tells you what the mindset is here in Panola County. They voted to have taxes raised so we could have a scoreboard," she said, with a laugh. "They're blind to anything else as long as we get to go to these football games. You'd think it was the Dallas Cowboys." Hambrick ascribes the pride the community takes in its football team to a loftier motive: "A lot of East Texas communities, kids are graduating, moving out, and not coming back . . . Carthage thinks differently. They want to have a place kids want to come back to."